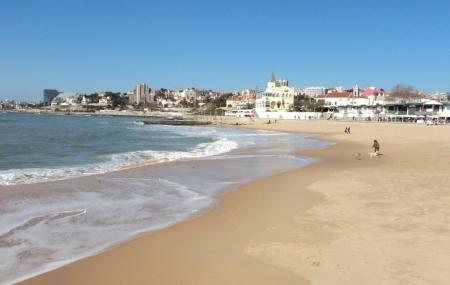 Find hotel near Tamariz Beach Or Praia Do .. In the day, this is a pretty standard beach – clean waters, nice sand, a good promenade. Restaurants and bars line the beach, and people here really seem to like the ice cream. You can rent sun loungers and umbrellas nearby. It’s very family friendly. In the evening, the nearby club fires up, and from then on it’s a rave. At the east of the beach, you’ll find a small chalet from 1890. It was apparently constructed for the terminally ill daughter of a rich industrialist. There is no car park nearby, and parking is especially bad on weekends. The parasol and chair rental prices are extravagant. Commuter train to the beach. How popular is Tamariz Beach Or Praia Do Tamariz? People normally club together Jeronimos Monastery and Belem Tower while planning their visit to Tamariz Beach Or Praia Do Tamariz. People also prefer to end their day with Tamariz Beach Or Praia Do Tamariz. Visited on a windy day, and thanks to the way the beach is formed, we were able to hide away from the wind and enjoy the sun. It is a very small beach which I can imagine gets busy in the summer as it is well connected to the train station. It has a good size promenade to just stroll when the weather is not as good. The beach is really nice. You just step out of the train an there you are. Only the restaurants and shops are very touristic. Just in front of the biggest end finiest Casino on Europe, probably. This is the most beautiful beach in Cascais, probably.